Okay, folkses, in case you haven't noticed, I recently hit 300 followers! Thank you all! I'll be doing a giveaway of some kind soon. In the meantime, if you're giveaway-hungry, check out Afterglow Book Reviews for the beginning of summer giveaway! Three-dimensional characters are complicated and conflicted. Whether we like them or not, we root for them to win. In order to have a three-dimensional character, we must look at three levels of characterization. And we're going to do it with a little help from the Doctor. As in Doctor Who. And yes, I did include a picture of the previous (tenth) Doctor. 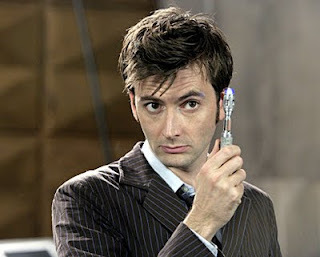 Because David Tennant is the TV equivalent of smothering something in chocolate. Mmm. In Doctor Who, for those who haven't seen this masterpiece of sci-fi television, the Doctor is a time-traveling alien. He is now on his 11th incarnation as a character-- you see, whenever the Doctor is close to death, his alien anatomy allows him to regenerate into a new body with a slightly different personality. When I first learned this, I thought the writers were crazy. That means we have to get used to a WHOLE NEW CHARACTER. Right? Kind of. The Doctor is a multi-layered character, and we're going to explore how that works well for re-incarnating him. Let's take a look at those three levels I mentioned earlier. This is the basic level of characterization-- and for some people, it's the only level they get to. It's made up of all the surface traits, quirks, habits, and personality of a character. It's the level the world sees, and therefore it's very important. This is what we see of almost everybody in the real world, too. This is the stuff most characterization sheets are made of. What they look like, what are their likes and dislikes, what are their quirks, what are their talents and flaws. In Doctor Who, this is the level of the Doctor that changes with each new incarnation. He has a new favorite outfit, new favorite foods, new quirks, and a new personality. There are some little things that carry over, but it's fun to see what a new Doctor will bring to the show. All those first-dimensional characteristics are nothing until you assign MEANING to them. Why does a character portray those first dimension traits? What makes him love one thing and hate another? Why does he act a certain way? What is his backstory and agenda? This level takes things deeper-- it's what allows readers to empathize with your character. If they just see a character turn away from helping someone who's gotten mugged, they will have no sympathy for the guy. But if they learn that he turned away because he himself was mugged and spent three weeks in the hospital because he fought back, and now he's terrified just to be out on the streets alone...well, now your reader gets it. They understand the why behind the surface reaction to run away. In Doctor Who, this level doesn't change from Doctor to Doctor. He is the last of the Time Lords. He has lost everything, and in a lot of ways, it's his own fault. There is a reason why the ninth Doctor is so hateful and cruel toward an alien creature that's being held captive-- it's a member of the race that helped destroy his own people. Because this level never changes in each incarnation, we still have the same empathy and connection to the Doctor each time he regenerates. A character shows his true self through his choices when there is something at stake. This is the level where your character will really take on life. In fact, it is usually the level where the character arc appears-- a character may take certain actions at the beginning of the book that are weak in some way, due to the demons in his backstory (level 2). But by the end, he must conquer those inner backstory demons to show a stronger self by the end of the story. Who that character is-- the actions he takes when all is at stake-- has changed (or perhaps not, depending on the arc), and that's the making of a truly deep character. Again, in Doctor Who, this is something that stays consistent. Or at least, consistently changes. It was particularly strong in the growth from the ninth Doctor to the tenth Doctor. His true character-- who he is at the core of his being-- is always the same. Or rather, it stays at the same place as it was when we left off, allowing the next Doctor to grow and change from a familiar place as we watch him. And that's why, despite the fact that there have been ELEVEN different Doctors, he is still just ONE Doctor to those who have watched. His outside may change, but inside, he is always the same person we love and relate to and empathize with. So, my friends, are your characters three-dimensional? What are some of your tips for deepening characterization? Who are some of your favorite 3-D characters? Do you love Doctor Who as much as I do? Yes I love Doctor Who! I don't write stories, but I think this was a perfect article on characterization!! At first, I was reading too quickly and thought you said, "How to avoid FAT characters." And, I wondered why you don't like FAT people ... uh, oops. And, I tagged you over at my blog! I love this and really needed a reminder of it for my character building I'm working on. THanks! I am getting that book and reading it soon! What a great analysis! Thanks for giving me lots to think about! did we bump into each other at the conference?? I can't remember! I'm reading Story Engineering right now and I'm finding it just as helpful as you did. 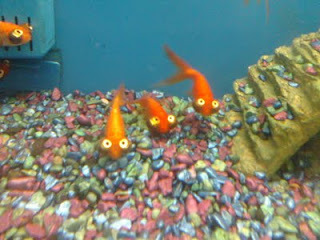 Love the pics with the goldfish. :D I think characters can make or break our stories, which is why we need to know as much as we can about them from the get go. I never got into Doctor Who, but this post makes me think I should check it out. Excellent advice and concrete examples. Thank you! I always love your checklists because I always think of my own characters and story and check it off in my head. Yep, got all three traits going for my main character. I'm all about the character development, and the motivation behind their actions. The fact that they have a physical story arc, and a more deeper, psychological story arc. That is spot on, and I love the Doctor comparison! Snape is a great 3-D character, imho. And I really hope I'm creating my own 3-Ds. The more layered and twisty, the better! Congratulations on hitting 300 followers! That alone is a geat achievement. I would love to donate my book for your giveaway! ...if you want it.